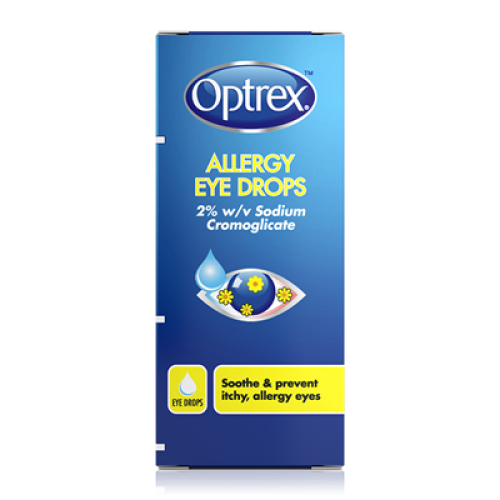 Optrex Allergy Eye Drops prevent, treat and soothe itchy, allergy eyes. They help to prevent and to treat the redness, watering and itching that are a misery for anyone suffering from hayfever or an allergy to house mites, pet hairs, etc. 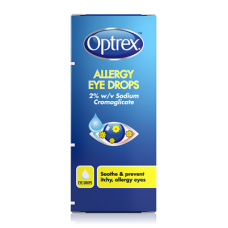 Used at the first signs of hayfever eye symptoms, Optrex Allergy Eye Drops can prevent the symptoms from getting worse. Remember! Use Optrex Allergy Eye Drops as directed in the patient information leaflet. The drops can be used to soothe and prevent itchy, allergy eyes throughout the high pollen season (usually April to September). (Do not use for more than three consecutive months without consulting your doctor). Discard 28 days after opening. Repeat steps in other eye. Don't use Allergy Eyes Eye Drops while or just before wearing your contact lenses. Wait 15 minutes after application before wearing contact lenses. Optrex Allergy Eye Drops is a pharmacy only medicine. Always read the label. For further advice about Optrex Allergy Eye Drops, please ask your pharmacist.